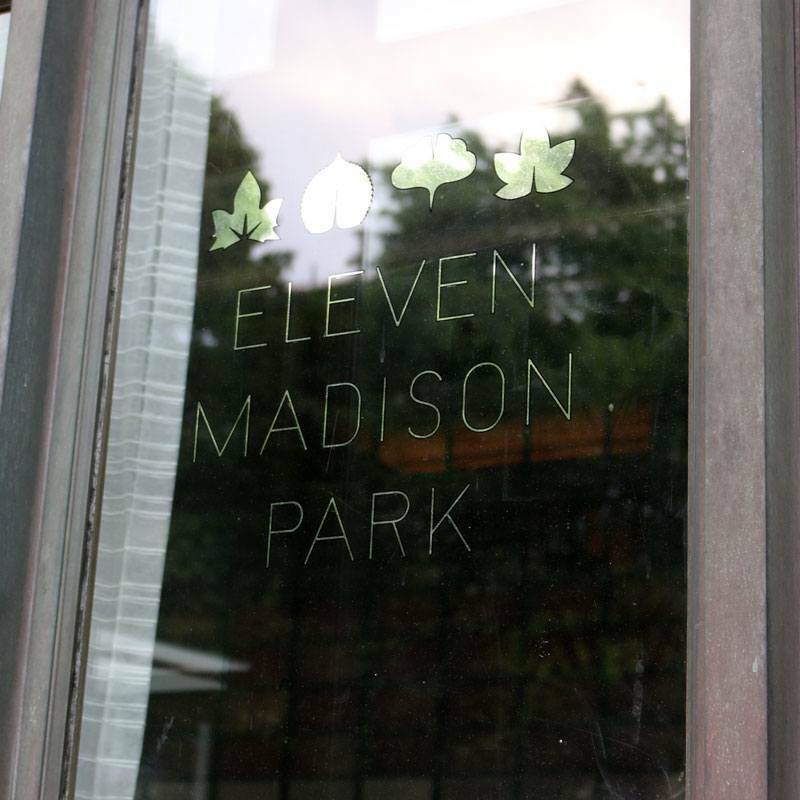 Eleven Madison Park: Busy New Yorkers proudly shorten the restaurant's name to "EMP". This is the restaurant where hungry gourmands from seven seas aim at 9 AM EST to secure a table - exactly 28 days in advance of the desired date. In front of its art déco entrance door, the Newly Swissed reporters stood nervously for 20 minutes, waiting for that rare shot at an interview with the Michelin awarded chef who keeps on earning accolades: Mr. Daniel Humm. And we had all but one hook: Chef Daniel Humm is originally from Switzerland. We could not resist to take a peek at the interior of Eleven Madison Park. Just moments before opening the doors that night, about 30 staff members in black aprons and ties were standing in a half circle - so still as if barely breathing. And there, a very tall man holding a list in his hand. An intense and sacred moment, because no one can interrupt the final fine-tuning before a night of orchestrating perfection. During the brief wait on a sofa under the ten foot tall ceiling, our anticipation was growing. We were sniffing the air to imagine the tailored menus for each lucky guest. When Daniel Humm appeared, I swore to myself that he must be the tallest Swiss man I had ever met! The Gault-Millau chef was dressed in a well pressed, pitch white chef top, greeting us with a genuinely warm, infectious smile. After a round of introductions (partly in English, partly in Swiss German), we wanted to know: How has being Swiss impacted his success in New York City? Humm was born and raised in a town in the Canton of Aargau. "[Being Swiss] - for sure it helps. There are so many factors, right? It depends on where you grew up, how you grew up. This makes you who you are... I think growing up in a small town helps you and gives a different perspective." Daniel Humm explains that a large city like New York presents lots of opportunities for young chefs. Whether one wants to learn pasta at an Italian restaurant, fish in a Japanese kitchen and pastries in a French cuisine, the opportunities are endless. However, he points out the risk of easily getting lost: "Before you know it, ten years have passed and you were all over the place." Humm discovered his true passion for cooking at an early age. In fact, he earned his first Michelin star at the young age of 25 while working at Gasthaus zum Gupf in eastern Switzerland. He attributes some of his success to his Swiss roots: "Growing up in Switzerland, if you want to work in a fine dining restaurant, there were a handful and you were picked. You worked there for many years, and that was it." In Daniel Humm's kitchen, everything has a purpose: "People say that I like everything to be precise. I don't know if it's my character or my being Swiss, but I think that this is an important ingredient to my success." In order to maintain precision from the chopping board to the dining table, Humm demands a lot from his employees – and from himself: "Things have to be a certain way, and there is no other way... We are shooting a new cookbook right now. It's a team of 10 people, and I’m just not easy to work with. (laughs) Maybe it's my Swiss way, you know? Stubborn?" Being stubborn and not accepting any compromises when it comes to his cooking are traits he describes as likely being Swiss. "But in a positive way. Otherwise, I'm very open outside of work," he added. A co-owner of Eleven Madison Park, the current number 4 on the San Pellegrino World's 50 Best Restaurants list, Humm spends six nights a week at his property. As if this were not enough of a commitment, Humm expanded across Madison Square Park to open yet another restaurant at The NoMad Hotel (as in North of Madison). "We want to grow the NoMad chain all over the world. I cannot be in that kitchen. It doesn't work. My job is to select the right people. And when I'm here, if I'm here, then I'm able to really train people. And then, when I let them go run their own kitchen, at least I had five years with them and I really know who they are." As a leader, Humm wants to provide a training ground for up-and-coming chefs to someday make it big. Just like the training he has received as a young chef in Switzerland. And good chefs, he will need: "It is not a secret: We are planning on expanding the NoMad concept globally!" His upbringing in Switzerland has taught Humm to live consciously and be thoughtful about the environment: "I was at home in Switzerland a couple of month ago, visiting my mom. After eating a yogurt, I threw the cup in the garbage, but she took it back out. She stripped the cardboard from the cup and removed the lid – putting them in different places. This teaches you a lot. Growing up that way, it makes you more aware, and I think that helps me a lot." Humm came across very down to earth as he let us in on the bread and butter of EMP. Humble would nail his business philosophy pretty well: "Everything has a purpose, even on a dish. There are no ingredients without a purpose. When we cook with vegetables, we use every part. Products are not to be wasted. Because we are fine dining doesn’t mean that we only use the tip of asparagus. We use every part." Humm has lived in New York for the past ten years. On average, he will visit Switzerland about once a year - at the most. But due to his many commitments, there has been a time when he did not travel to Switzerland in two years. As many Swiss abroad would confirm, the idea of Swiss comfort foods can trigger some nostalgia. Humm temporarily switched to Swiss German to explan his food preferences when in Zürich: He cannot miss a Bratwurst from Sternengrill or a cup of coffee from Café Schober! The icing on the cake this afternoon was the unexpected book signing. 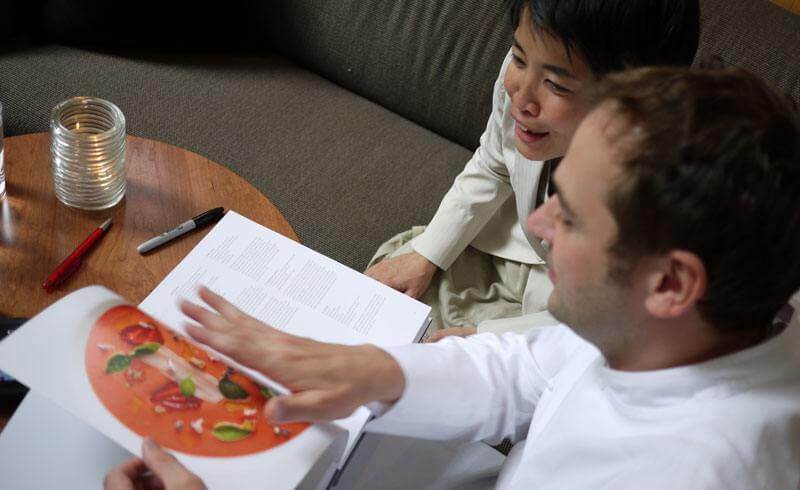 As our interview was winding down, Daniel Humm suddenly pointed at a display copy of his own cookbook. We had browsed the book while waiting for the interview, but now he wanted to dedicate it to us! What a moment of joy! "So, which recipe should I try back in Switzerland? ", I asked. Daniel Humm did not hesitate for a second: "Try the strawberry gazpacho." Humm added: "It's really difficult, though..."
This line coming from the cream of the crop of gourmet chefs made me realize something: Despite the name, Eleven Madison Park: The Cookbook , I was holding not just a cookbook. Rather, I was presented with Daniel Humm's personal collection of the highest forms of cuisine - haute cuisine! Finally, we asked the busy chef for a quick selfie before seeing him off. Instead of giving in, Humm called a staff member to help take a proper group picture. The big eyes of the waitress revealed how honored she must have felt to assist her boss. 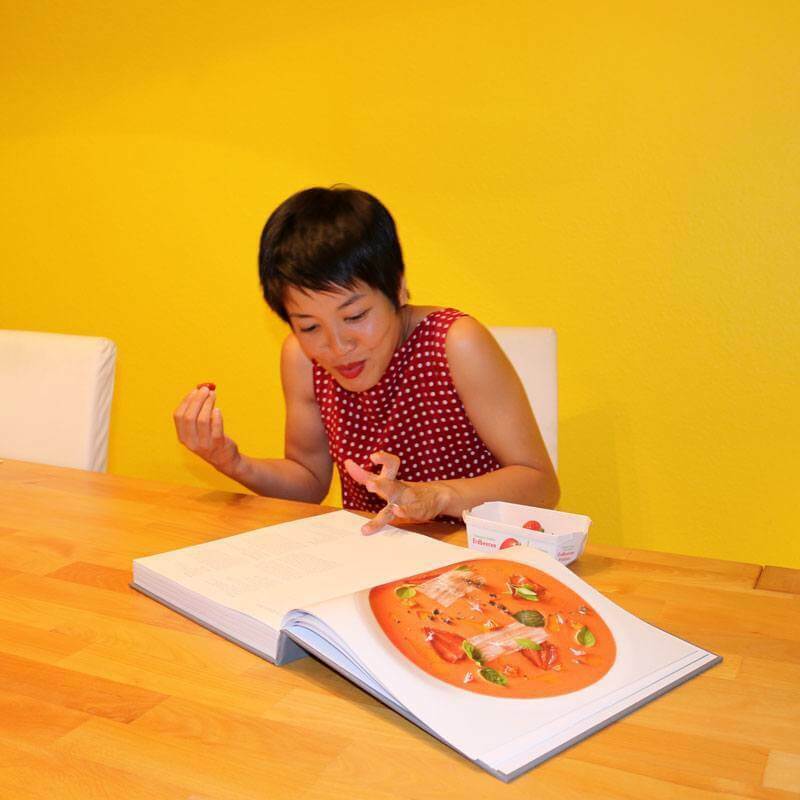 Back home in Switzerland, I started studying the recipes. And oh my: The large, amazingly detailed photographs appeared almost edible!